How many times have you been downtown with the kids for a special occasion — maybe a theater show, a fancy shopping trip or a holiday outing — and wondered: Where the heck should we have lunch? There are plenty of high-end restaurants perfect for pre-theater dining or bars and pubs for late-night noshing sans kids, but family-friendly, affordable eateries are harder to come by. This list is your arsenal against defaulting to McDonald’s or Taco Del Mar, offering up delicious alternatives that all members of your clan will love. Pike Place Market is full of great places to indulge your inner gourmand, but the last thing you want to do after a day of wandering malls and waiting in carousel lines is to wait in another line with hungry kids in tow. At the Market, the answer is to pop into Uli’s Famous Sausages, a cozy spot tucked away in the covered ground level of the market (right up from the Gum Wall). Choose from an assortment of sausages, served straight up or on buns, from Polish kielbasa to Cajun andouille. They’re ultra-fresh, antibiotic- and hormone-free, and pair well with either a basket of fries or German sauerkraut. The tiny, dark interior feels like a best-kept secret, and it’s just as likely that you’ll be sitting next to a chef on his break as it is a tourist. Adults can enjoy a beer on tap or a glass of wine. While you’re there, buy some links for quick weeknight dinners or hearty breakfasts! Hours: Daily, 11 a.m.–5 p.m.
Also in the market is a new spot from Miles James, former owner of beloved Dot's Charcuterie & Bistro in Fremont. 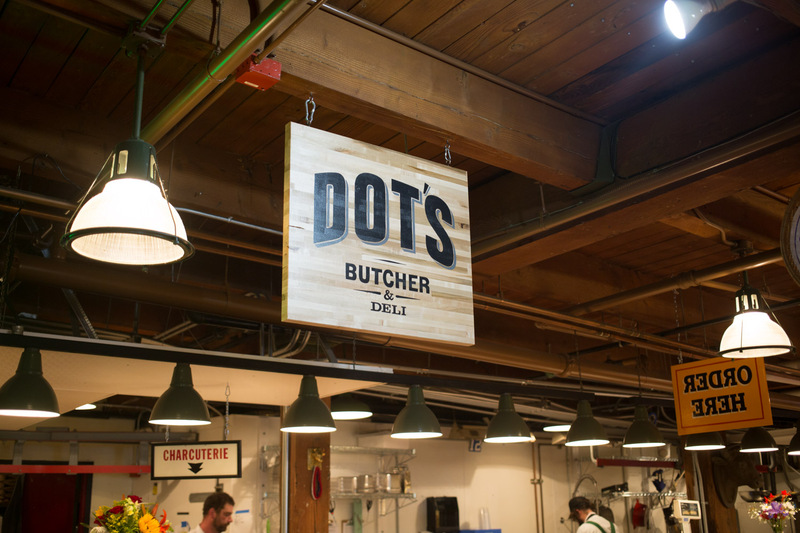 He's back with Dot's Butcher and Deli, a revamped spot in the Corner Market Building at the corner of First Avenue and Pike Street. 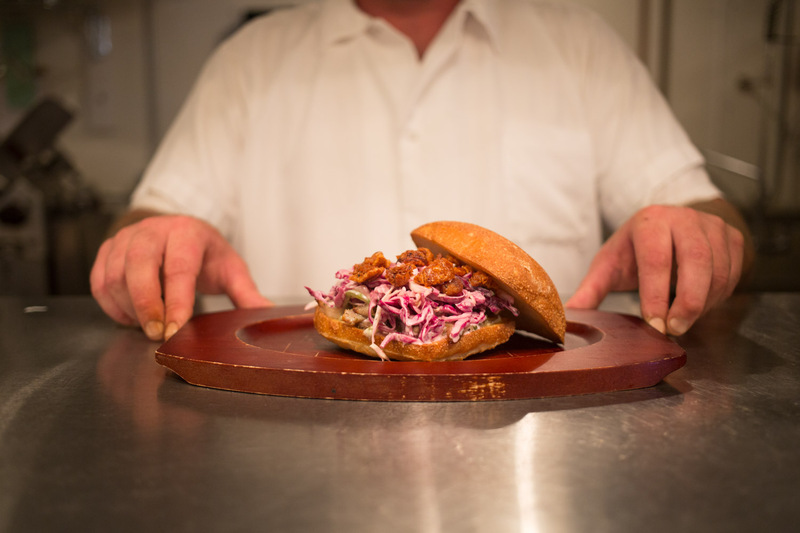 Word is that the sandwiches are to die for — from a cheesesteak with Mama L’ils Peppers and a housemade “cheese whiz” (a béchamel-style sauce with three cheeses and some turmeric) to a classic Italian meatball sub. Sides includes the likes of pasta salad made with Il Corvo pasta and a chickpea salad with feta. James has serious cooking chops, having worked with local restaurateurs Ethan Stowell and Daisley Gordon. Just a stone's throw from The 5th Avenue Theatre (The Little Mermaid), and Seattle Sheraton (Harry Potter gingerbread village), a Mod Pizza outpost can fuel your hungry elves. 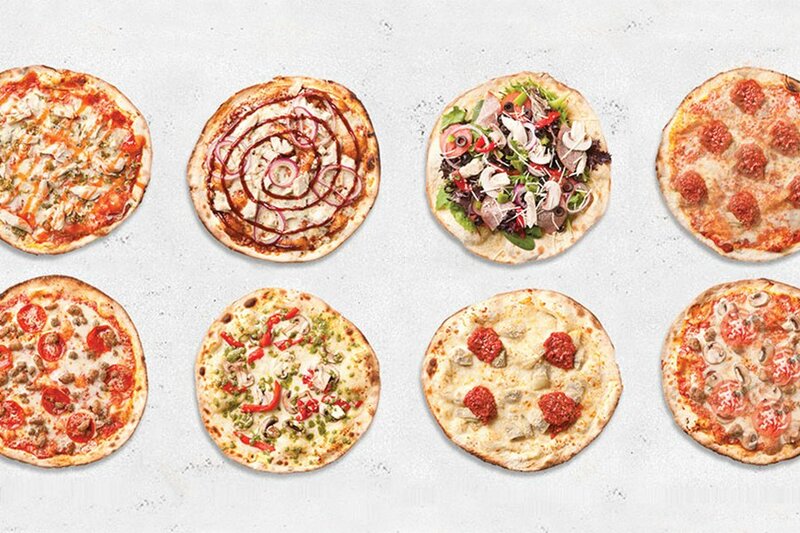 Mod has spread throughout Seattle like wildfire, thanks to its winning formula of custom-made personal pizzas. Choose a sauce (tomato? pesto? BBQ? ), a meat (pepperoni, Canadian bacon, grilled chicken) and then pile on as many toppings as you want for free (everything from artichokes to pineapple). Finish it with a signature “swirl.” Adults might prefer something a little more gourmet, like balsamic fig while pickier kids may just want some red sauce dollops plus cheese. Depending on whether you’re feeling decadent or healthy, add a milkshake or a salad to the mix. Hours: Monday–Saturday, 10:30 a.m.–9 p.m.; Sunday, 10:30 a.m.–7 p.m. Kids may balk at the name Veggie Grill, but once inside the colorful, fast-casual vegetarian and vegan spot, which sits kitty corner from Westlake Park and its holiday carousel, they’ll be temporarily brainwashed by the faux chickin’ nuggets and burgers, made from meat substitutes and doctored up with delicious sauces. 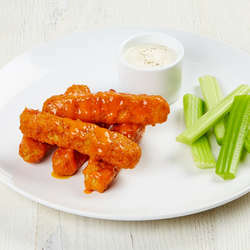 The Buffalo "wings" are a universal hit, made from tempeh and slathered in wing sauce. But it’s not all about fake meat here. The restaurant makes some seriously killer salads and bowls too, like a curry “Masala” bowl brimming with chickpeas, rice and cauliflower or a "Quinoa Power Salad" to which you can add a veggie protein such as tofu or falafel. A kids' menu offers a main (like a grilled cheese or burger), a side (such as sweet potato fries and carrot sticks) and a dessert (perhaps a cookie or a half-slice of carrot cake). Hours: Monday–Saturday, 11 a.m.–9 p.m., Sunday 11 a.m.–7 p.m.
Wild Ginger may look like an upscale restaurant and, indeed, the downtown Asian fusion spot is a go-to for corporate parties and well-heeled diners. 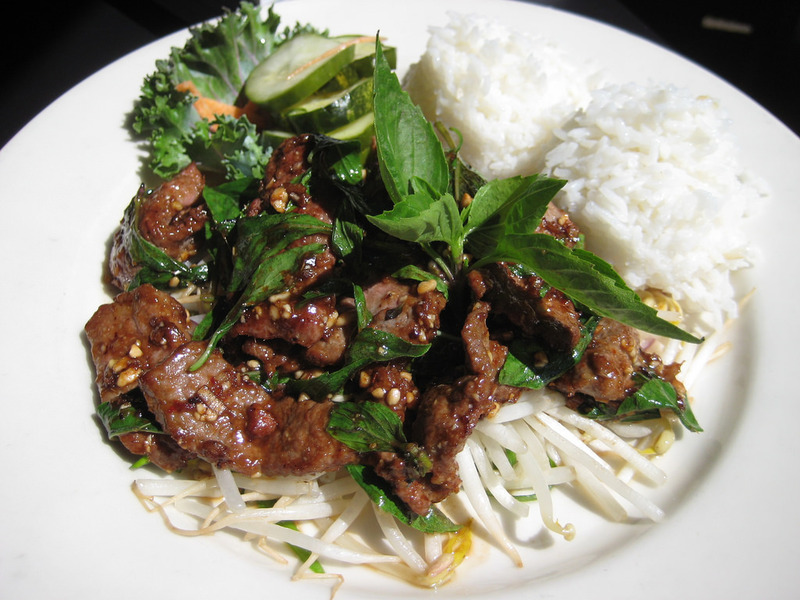 But at lunch, its satay menu makes for a great, affordable option right in the heart of downtown. Cambodian style-short ribs, Thai chicken, salmon, prawns and other meats are served up on a stick with dipping sauces and come in portions for one or two. There’s also plenty of other kid favorites such as pad Thai and mandarin chicken. If you don’t want to sit and eat, the establishment recently opened a to-go counter in the former Triple Door box office, Wild Ginger Kitchen, and offers a bimonthly rotating menu of proteins served with noodles. Pick up to eat at home! Hours: Monday–Saturday, 11 a.m.–11 p.m., Sunday 4–9 p.m.
You may never have noticed that the The Moore Theater has an attached coffee shop that serves up some of the most delicious, fluffy waffles you’ll find in Seattle, as well as tasty sandwiches. Waffles come in sweet (Nutella and banana, PB & J with almond topping, brie and berries and apple cinnamon) and savory (bacon with mascarpone cheese, prosciutto with cream cheese and basil and turkey apple) iterations. On the sandwich menu, choose from ham and brie with arugula and olive oil; a roast beef club; or a roasted chicken quesadilla with avocado and tomato. There’s even a selection of small plates such as housemade granola parfaits, croissants filled with berry jam, warm oatmeal and bagels with various spreads. The space is small and cozy, and typically gets most crowded during breakfast hours. Hours: Monday–Friday, 6:30 a.m.–4:30 p.m.; Saturday 8 a.m.–4 p.m.; Sunday 8 a.m.–2 p.m.